Guest Contributor Jonathan Stevenson / MFA exhibitions are notoriously hit-or-miss, not least because it’s difficult to pull together a group show from graduates who may not be following aesthetic avenues that are sufficiently kindred to ensure the coherence that a freely curated show can have. Both strong institutional guidance and a rich pool of MFA students are required. The Pennsylvania School of Fine Arts apparently has both, and, as program chair Clint Jukkala suggests in his catalogue introduction, these features have enriched “the fluidity and the cross-pollination that occurs when a group of artists work closely together over time.” PAFA’s MFA show “And Many More,” sagely juried by PAFA curator Jodi Throckmorton and up at 33 Orchard on the Lower East Side, presents an admirably balanced blend of relatively mature but still evolving work–traditional, conceptual, and video-based–by nine 2015 graduates. 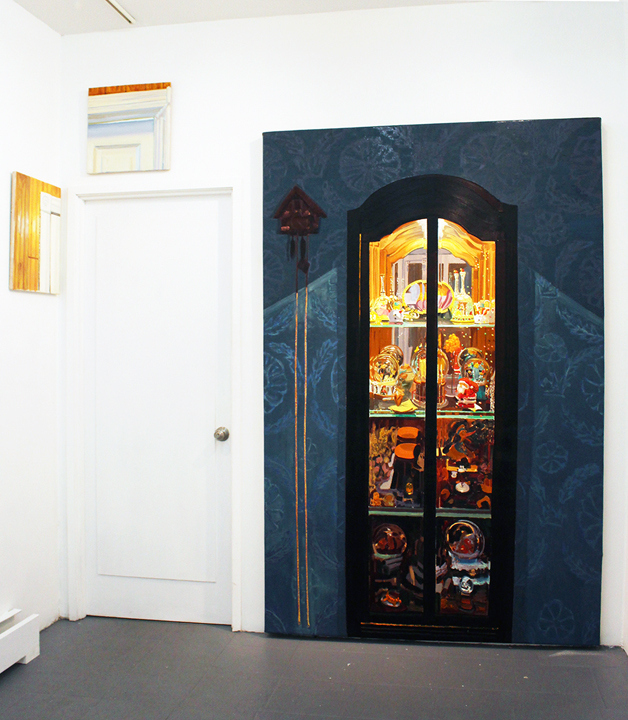 Background (right), Sara Fry’s Ingress. 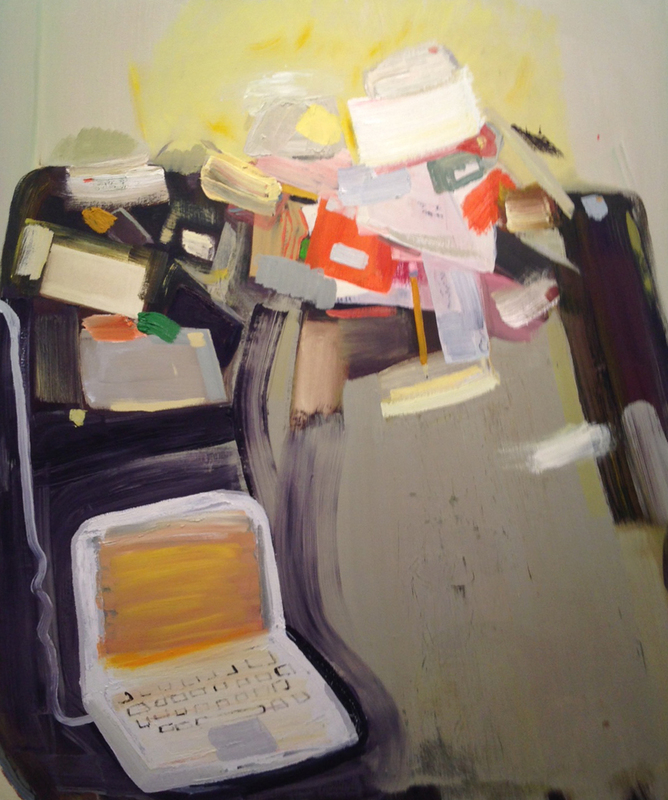 Foreground: Julie Thompson, Untitled 1. Marcelle Reinecke, Whittling Barry, 2015, acrylic and oil on canvas, 30 x 24 inches. 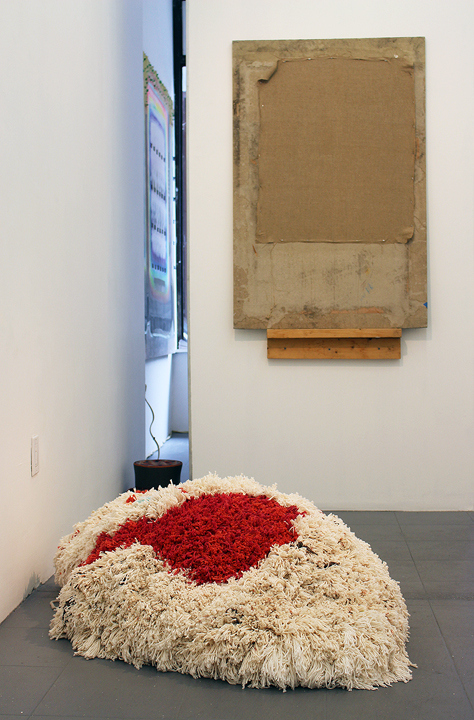 Sean Hildreth, installation view. Magic Cabinet on right. 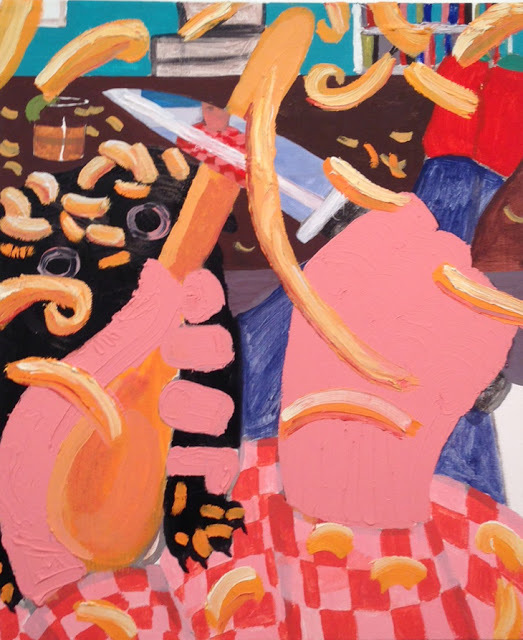 Marcelle Reinecke zones in more directly on primitive activities (carving, drinking, smoking) and feelings in her joyfully frenetic (and ominous) Whittling Barry and three clever gouaches riffing on day-to-day anxiety. Sean Hildreth cultivates a comforting affinity for household views and objects in finely rendered realist paintings that ease from Auster-like mysticism in his large canvas Magic Cabinet to more tranquil drollery in small pieces like Bathroom Hero (an electrical outlet) and Kitchen Silver (in fact, the reflection thereof). 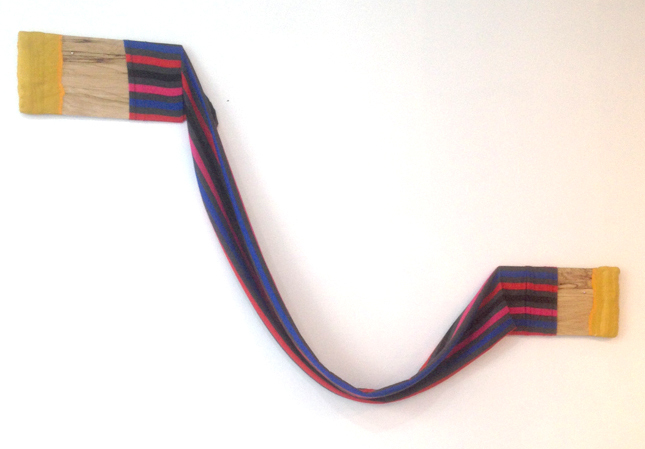 Nadine Beauharnois, Dip, 2015, fabric, wood, palster, oil paint, 6 x 48 inches. The conceptual artists’ work is penetrating and at the same time impressively avoids didacticism. Each exposes or explores some existential fissure or fault line. Sara Fry’s Ingress, consisting of an easel or bulletin board holding a tenuously stapled linen rectangle above a lightened segment of homasote that simulates an entryway, trenchantly evokes a bland yet irresistible void. Leaning on a nearby wall, her wood-and-grass My Mane conjures both a broom and a woman’s hair. Equally terse is Nadine Beauharnois’ Dip – a tube of striped fabric loosely attached to pieces of wood that had been dipped in plaster and paint and then wall-mounted at different heights – which seems to impart the chronic discontinuity of life, while her hypnotically crooked sculpture How The Animals Got Their Colors might reflect the erratic nature of evolution writ large. 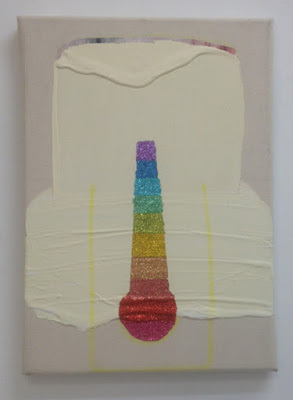 Mingfei Cui, I Wanna Speak, 2015, acrylic, glitter on canvas, 11 x 15 inches. 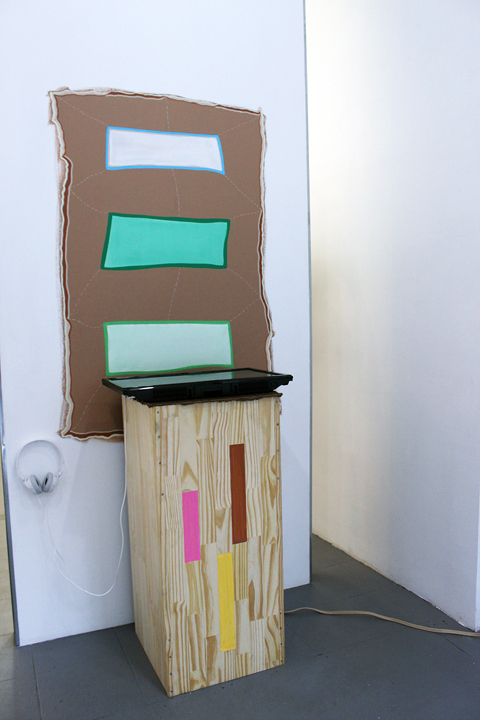 Mary Claire Ramirez’s wall sculpture Untitled (Rockite) and inkjet print Stereotype (Stage Right) appear to recognize artifice and instruction, respectively, and to question their integrity or validity. Julie Thompson’s robust cotton constructs, one mounted and one freestanding, playfully bring to mind how small the separation between the organic and the inorganic can be. Finally, there is Shane Smith’s immersive twelve-minute video meulogy, which means indirect praise. A young man heartbreakingly and caustically imagines his own death, eulogizing and mourning for himself. While the film resonates of Beckett and the Swedish filmmaker Roy Andersson – and in places Monty Python – Smith is already finding a voice of his own. So are the eight other graduates represented in this fine show. “And Many More: Nadine Beauharnois, Mingfei Cui, Sara Fry, Sean Hildreth, Morgan R. Hobbs, Mary Claire Ramirez, Marcelle Reinecke, Shane Smith and Julie Thompson.” 33 Orchard, LES, New York, NY. Through July 5, 2015.